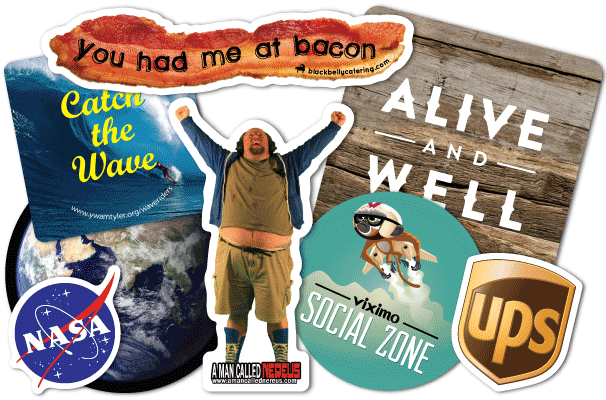 StickerGiant can print full color custom printed stickers for your business. Our Full Color High Resolution Stickers are printed digitally for the best color reproduction. We can match Pantone© Colors or provided sample colors. Free Die Cutting Create a custom shape and make your sticker unique. StickerGiant can cut your sticker into almost any shape. Our art team can help you setup your dieline for your sticker at no charge. Ships Next Business Day Finalize your order and approve your proof by Noon MST and most jobs will print and ship the next business day. Sometimes we have to take extra time to get your artwork just right, but usually the process is a breeze. Learn more about turnaround and production times. Full Color Matching Our digital press has amazing color reproduction, helping your sticker get noticed. Unlike flexographic or silkscreen printing, our digitally printed Kiss Cut Stickers have nearly perfect color reproduction. More about CMYK color. Heavy Duty Material We use the best vinyl and plastic combined with acrylic adhesives to make our sticker heavy duty material. Our stickers feel substantial without being too thick, or too thin. More about our materials. Durable UV or Matte Lamination Our lamination makes our stickers special. Extra heavy duty UV lamination will resist fading outdoors. We also offer silkscreen printing for additional durability. Free Shipping Ground shipping for orders placed online is free in the contiguous United States. More about shipping.